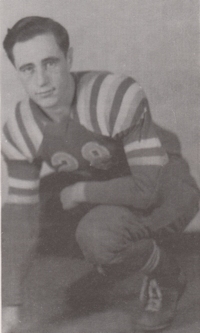 Obituary – Malzahn, Gus Edwin George “Ed” « Perry High School Alumni Association, Inc.
– played football for two years, went out for wrestling one year, was in the bank for 6 years, performed in two operettas, held membership in the Boy’s Trio and the Boys’ Glee Club, and appeared in several short plays during his high school days. He has no hobby except hard work and plans to follow his schooling here with a college education. He is a native of Perry. Edwin’s parents are Mr. and Mrs. Charles Malzahn of Perry. Gus Edwin George Malzahn (Ed), 94, of Perry, Oklahoma was the son of Charles and Bertha (Wolff) Malzahn. He was born on July 3, 1921 in Perry, Oklahoma and died Friday, December 11, 2015 in Perry Memorial Hospital. Ed graduated from Perry High School in 1939 where he was an Eagle Scout, played football, played in the band and participated in several theatrical plays. He was known to pull out his cornet and play ”Dear Old Perry High” if you asked. After high school he completed a degree in mechanical engineering at Oklahoma A&M College (Oklahoma State University) where he met the love of his life, Mary Corneil. She was his favorite student in a machining class he taught. Married on May 22, 1943 they were inseparable…Ed and Mary. Ed was a member of the First Presbyterian Church where he served as an elder for many years. He taught the adult Sunday school class for over 50 years which was a ”temporary” appointment when Henry Bellman abandoned the responsibility to serve as governor. 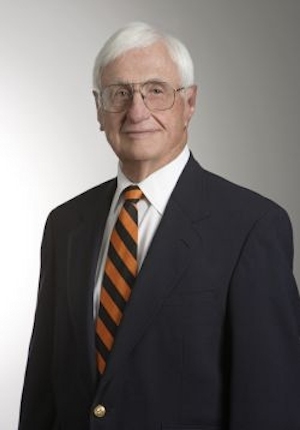 He has served in countless leadership positions from Oklahoma Board of Regents to the Chair of the State Economic Development Commission to the Chairman of Equipment Manufacturers Institute. Ed was very enterprising. Even as a young boy, he always had a project to engage his interests. He cast silver dollars for his friends at age 13 resulting in a visit from the FBI. He built a remote control spotlight at age 17 that caught the attention of the Air Force when he was caught ”spotlighting” aircraft…again resulting in a visit from the FBI. He was always tinkering with something. He continued his innovative ways and in 1949 he developed the world’s first service line trencher, the Ditch Witch model DWP. Perry, Oklahoma and the world have never been the same. A new industry had been created. Even in his later years he always had a project with the latest being the conversion of a Perry landmark, the Masonic Lodge, into a multi-unit residence. But, no matter what project he was working on he always had time to roam the halls of Ditch Witch as ”bull of the woods” to find treats for his sweet tooth, blow bubbles at a birthday party, or make a special delivery of roses from his garden. Ed is survived by three children, Don Malzahn, and his wife, Phyllis, of Wichita, Kansas; Pam Sewell, and her husband, David, of Perry, Oklahoma; and Meleasa Malzahn of Truth or Consequences, New Mexico. He has nine grandchildren, Tiffany Sewell-Howard, and her husband, Dan, of Edmond, Oklahoma; Jason Sewell, and his wife, Katie, of Perry, Oklahoma; Cody Sewell, and his wife, April, of Perry, Oklahoma; Zahn Wilkerson, and his wife, Kelly, of Tempe, Arizona; Courtney Darrah, and her husband, Will, of Wichita, Kansas; Sarah Malzahn of Englewood, Colorado; Matthew Wilkerson, and his wife, Briana, of Tempe, Arizona; Whitney Wilkerson of Tempe, Arizona; and, Perry Malzahn, and her husband, Jason Brammer, of Wichita, Kansas. He also has thirteen great-grandchildren. A memorial will be held from 6:00-8:00 p.m. on Friday, December 18, 2015 at the Ditch Witch Training Center, 1947 West Fir Ave., Perry. Funeral services will be held at 2:00 p.m., Saturday, December 19, 2015 at the First Presbyterian Church, 1922 N. 15th St., Perry. Rev. Joshua P. Kerr will officiate. Services are under the direction of Brown-Dugger Funeral Home, Perry. A memorial contribution may be made to the Perry Memorial Hospital Foundation in care of Brown-Dugger Funeral Home, 1010 N. 7th St., Perry, Oklahoma 73077. He was preceded in death by his parents and one sister, Virginia Lamb of Edmond, Oklahoma.